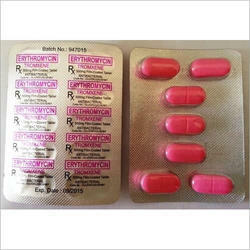 Erythromycin belongs to the class of medications known as macrolide antibiotics. It is used to treat infections caused by certain types of bacteria. It is most commonly used to treat the following: lower respiratory tract infections such as pneumonia, whooping cough, diphtheria, and Legionnaires' disease. As per the specific needs of the clients, we are engaged in providing a high quality range of Erythromycin Stearate Tablet. 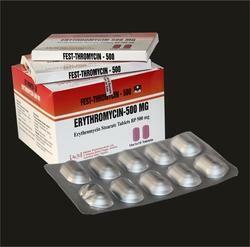 Erycon 250 MG Tablet is a macrolide antibiotic which is used to treat infections caused by the bacteria in the lungs, throat, and ear. Inform the doctor if you are allergic to this medicine. It is an antibiotic used to treat bacterial infections. Sign Pharma Trade Services Pvt. Ltd.